I don't usually have writer's block, per se, as you see it in fiction,* where it's the crippling type that has the writer seemingly blank on ideas, like he's living in a white blank-paged wasteland of imagination. It's a popular image that's (ironically) inspired different systems and techniques to beat the block. Over the past couple of years I found a few that might do the trick or they're at least fun enough to make your writing breaks a bit more creative. The latest is a Kickstarted game by Dejobaan Games. In this recently released PC game, you are the lone survivor of an expedition to an abandoned planet. You aren't the pilot -- or the archaeologist -- you are the poet. Your character roams the beautiful scenery and writes about what they see. You can either write free from or pick a theme, like You Realize The Whole Planet Is Artificial, that prompts your story. Players can also share, read and rate their stories on the cloud. 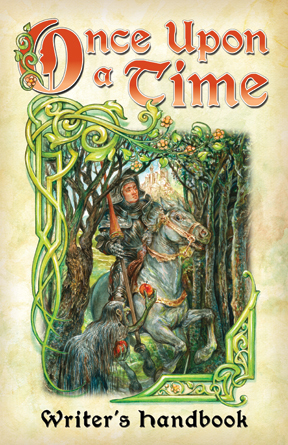 You've got nine dice with pictures, you've got game rules on how two or more players can make a game of storytelling or play solo and see if the mental exercise can loosen up your brain blockage. OUaT is a card game that lets people empty their hand as they tell a story, but other's can interrupt the flow with their tale to tell. 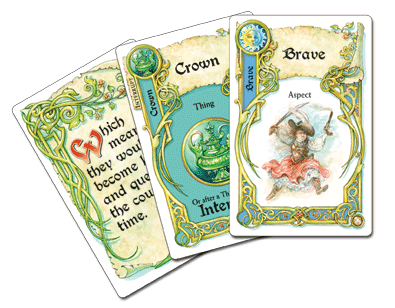 The game ends when a player ties in their story with a unique "Happy Every After" card, which also has to be their last discard. Not only is it an award-winning game that's been around for decades (not that I would personally know ... stop looking at me like that.) But there's also a book that turns the cards into fun writing exercises. So there you go. More ways to incorporate storytelling into your life and fight writer's block. Or at least a way to tell your internal editor that you're "brainstorming" for a story when you've got dice and cards in hand. *The things that stump me are how to express my ideas ... and the willpower to stick with an idea long enough to get it finished.